* Push to device was aborted. 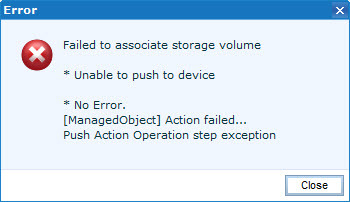 Service provisioning failed while trying to provision storage. I successfully re-discovered Vblock to confirm all usernames, passwords were OK and ECOM service is running but still could not provision storage. 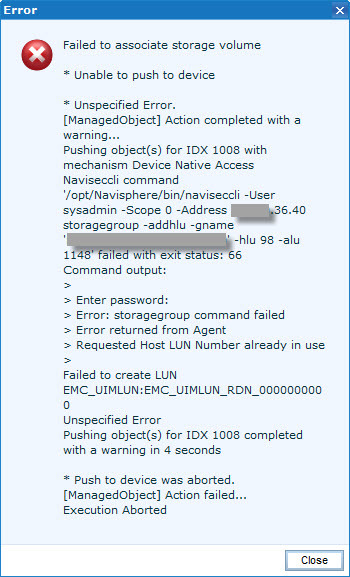 I also recently upgraded one VNX array from 5.32.000.5.207 to 5.32.000.5.209 but it was not the issue as the other array on 5.32.000.5.207 exhibited the same errors.